First, I want to say thank you -- thank you to those of you who left comments on my last post and on my Instagram post, to those of you who sent me messages of support and sympathy, and to those of you who sent prayers and thoughts to those who were killed and injured. While it is impossible to make sense of what happened here on Saturday, it is possible to continue to live our lives knowing that the community is rallying around us. The Mister and I purposefully took Rainbow to the vigil held on Sunday evening so she could see just how much love and support is there for our community. It was standing room only inside Soldiers & Sailors, and there were crowds of people outside in the rain as well. For days, I have received text messages and e-mails from friends and family near and far, letting me know they are thinking of us. When I arrived at work yesterday, I received so many warm hugs. The week ahead will continue to be difficult as funerals are held for the victims, but we've all received so much support that I know we will get through it. Elizabeth Zimmermann famously said, "Knit on, with confidence and hope, through all crises." And I have tried to do that, though on Saturday I found it extremely difficult. Before this weekend, the only other time I have found myself unable to knit was when I had appendicitis. Now, though, I am once again finding it a real comfort. One project that I'm determined to finish soon is my Swing Left socks, which will be done in time for me to wear on Election Day. I'm already on the gusset of the second sock, so I'll likely be done even before the end of the week. Please excuse the dirty windowsill. I normally try not to get political on the blog, because although knitting can be a political act, it typically isn't a partisan one. But as one of the rabbis reminded us on Sunday, the American people look to our leaders for guidance of how to treat one another, and tragedies can happen when people hear the bigoted rhetoric of some of our leaders and use it as an impetus to do violence. If you aren't satisfied with the leadership of your elected officials, you can tell them so, but the most powerful thing you can do is vote. So if you are an American citizen who is eligible to vote, and you haven't done so already, please make a point to do so! I don't care who you vote for or if your views are entirely opposite to mine -- it's a right and a privilege to be able to cast your ballot. I am reposting this from Instagram, so my apologies if you've read it already, but I felt it was important to post here, too. Yesterday an unspeakable tragedy happened in my city. A man filled with hate entered the sacred space of a synagogue and took 11 innocent lives. My family and loved ones are safe, but we have friends who have lost people dear to them. And this horrific act has shattered the sense of safety and acceptance we have always felt in this community. Tree of Life is a special place to my entire family. We were all members there until just a few years ago. It was the synagogue where I grew up: I received my Hebrew name there, attended Hebrew and religious school there, was called to the Torah as a bat mitzvah there, was confirmed there, was married by its rabbi, and gave my own daughter her Hebrew name there. It has been a rock in my life and in my community, and I am absolutely devastated by the violence that occurred there yesterday. As the news unfolded yesterday, one thing that kept me from giving into the grief entirely was the sheer number of people who contacted me to make sure I was safe — friends, family members who live in other cities, coworkers and former coworkers, Internet friends I have never met in person, former classmates I haven’t talked to in many years. In the face of hated against people who share my beliefs, I was told that I was loved. 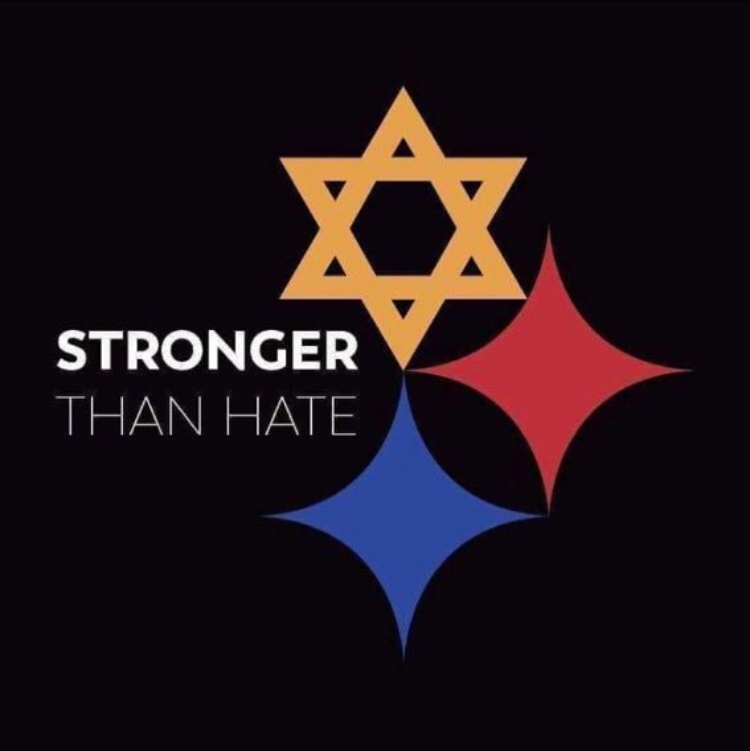 I am so grateful for everyone who checked on me yesterday, for the first responders who risked their lives yesterday and likely prevented this tragedy from being much worse, and for the greater Pittsburgh community for coming together to show Pittsburgh’s Jewish community that we all stand together. As these tragedies become more and more frequent, we are often left feeling helpless. But there is much we can do. If you know someone who is a member of a targeted group, let them know that you care for and value them. Give blood if you can. Volunteer for social justice organizations. Donate to organizations that fight bigotry, like the Anti-Defamation League and the Southern Poverty Law Center. Speak up against hatred. Vote. How Many WIPs Is Too Many? Those of you who know me (in real life or through this blog) know that I'm not the type of knitter to have a ton of projects on the go at once. I typically have two or three things in progress at any given time, usually a small project (like a pair of socks or a hat) that travels with me to work and a larger project or two that gets worked on at home. I have a tendency to feel overwhelmed if I have too many WIPs going because I feel so conflicted about which ones to work on at any given time. So I'm finding myself in a rather strange spot at the moment. Right now, I have three active WIPs: my Swing Left socks, my striped Fibernymph Dye Works minis shawl, and my Floozy cardigan. I've also got a sort-of fourth WIP, which is a pattern submission swatch that is essentially a finished project, or at least half of one (it's an ankle sock pattern, and it made more sense to just knit a complete sock than to try to make a sock-shaped swatch). And I'm on the verge of casting on yet another sweater -- one with a deadline, no less. 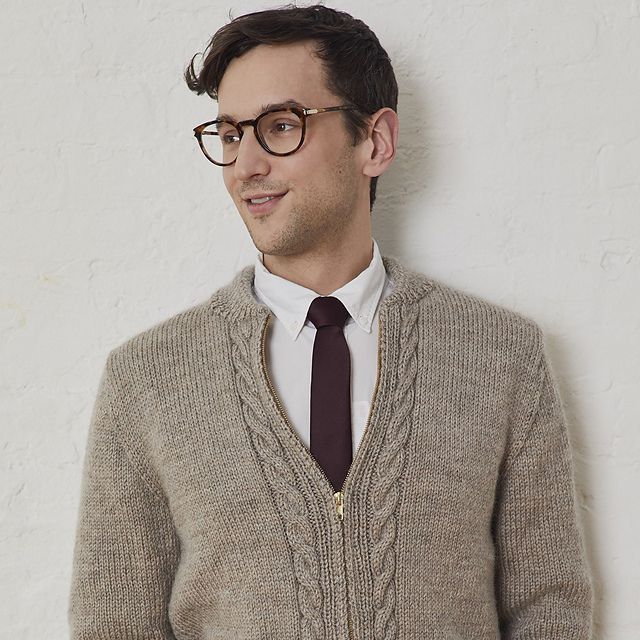 This is the Neighborly Cardigan from Lion Brand, a free pattern on the LB Web site. It was designed to look like one of Fred Rogers's sweaters (which were knit by his mother -- did you know that? ), so I didn't have to try to find something close enough and adapt it. It's knit in worsted weight yarn and is mostly stockinette, so I'm hoping it will be a relatively fast knit. Knowing that the Mister isn't likely to wear it too often after the party, I suggested we pick a more affordable yarn and sent him to the Knit Picks Web site to look at color options. He picked this shade of Swish Worsted called Squirrel Heather -- which is, now that I look at it, remarkably similar to the LB used in the sample! I am hoping that I can get something off the needles this weekend so that I feel more comfortable starting this project, though of course I'll need to swatch first. Fortunately we've got a quiet weekend ahead, and Saturday is supposed to be a perfectly miserable, rainy day, so what better to do than curl up with my knitting?! It was a whirlwind of a weekend -- a fun whirlwind, but a whirlwind nonetheless. There was a lot of driving, a lot of time on my feet, and probably not enough sleep. But it was wonderful, and I can't wait to do it again next year (the Ross Farm folks have already asked me to come again, so I just have to put it on the calendar). At Needles Up, I picked up one braid of fiber from the Classy Squid Fiber Co. This is Amanda's Opulence blend -- Rambouillet, cashmere, Tussah silk, and bamboo -- and I couldn't resist it. I also picked up the Fibernymph Dye Works special Rhinebeck colorway, called Rhinebeck ... Sweater Weather? (the stripes are meant to illustrate the potential temperatures for the festival weekend), and two lip balms from Tuft Woolens. At Jill Draper's, I picked up three skeins of yarn (we will ignore, for now, the fact that I have yet to knit up the skeins of JDMS yarn I bought at her open studio last year or the sweater quantity I bought at Maryland Sheep and Wool this year): two skeins of Mohonk for a shawl design and a skein of Mini Empire to make myself a hat. The colors in this photo aren't as accurate as they could be, given that I snapped this photo early this morning before the sun was really up, but I think you can get the idea. While we were all very busy during the actual festival, the long drive to and from Rhinebeck make for good knitting time. On the way up, I cast on two new projects. First, I finally got started on my Floozy cardigan and managed to get through all the short rows before we got there. I have since added the first rows of the second color, but I didn't get a chance to snap an updated photo. I added some additional stripes to the shawl as well, so lots of progress was made in general. All in all, despite the lack of sleep and the cold weather on Sunday (so cold I had to steal some samples from the booth to put some more wool on me), it was a great weekend. I got to see old friends and meet new ones, eat some delicious meals, and spend several days in the company of "my people." I'll admit it was a bit hard to get up this morning and go to work, but Rhinebeck weekend can't last forever and it's back to the regular schedule this week. Through the magic of technology, this post will be going up for you to read even though as you're reading this I'm several hundred miles away at the New York Sheep and Wool Festival. No spinning will be happening while I'm on the trip, but before I left, I was able to finish up the second bobbin of singles for my combo spin. It's interesting to me that the last color on both bobbins is very similar, if not the same. I do wonder how often that color will pop up on all three bobbins and how often the colors of the singles will coincide when they're all plied. I suppose if I want a preview, I could take three strips of fiber and twist them together, but that feels a bit like cheating. And part of me likes having that curiosity as motivation to finish spinning the singles. This second bobbin didn't take me very long at all to spin (I think I started it last weekend, ignored it for the week, and did all but about 20 minutes this past weekend), so I'm sure that I can get the third one done in a reasonable amount of time when I'm back from my trip. I'll be using my miniSpinner to ply, in part to save my legs the workout but mainly because it's the only wheel that has bobbins big enough to hold 6 oz., so it shouldn't make me wait too long to see the finished yarn. Shortly after I post this, I'll be getting in the car to drive out to meet Amy and Scooter Pie so we can start the long drive up to New York. While I'm not nearly as excited as I was last year for my first-ever trip, I'm very much looking forward to the long weekend away -- not least because of the amount of knitting time I'll have. I'm taking probably more yarn and projects with me, but options are always good, am I right? First, I've got the Fibernymph Dye Works mini shawl, which I was hoping would be done by this time but obviously had a setback when I ripped and restarted and didn't see much action when I was on deadline to finish some design projects. I'm determined to put some serious time into it and get it done soon. I'm also taking yarn for two new projects to cast on. The first is my Swing Left socks, using the kit I bought from Little Skein in the Big Wool. I've already wound the yarn and printed out the pattern, so those are ready to go. The project I'm most excited to start is my Floozy cardigan, which I'd intended to knit to wear to Rhinebeck but obviously did not (heck, I never even cast on for it!). I did, at least swatch, but my gauge was off a tad despite going down to a US 2/2.75 mm needle. I couldn't imagine knitting an adult sweater on US 1 needles, so I'm going to be knitting a different size than I normally would to account for the difference. It'll still be a lot of knitting, but at least most of it is single-color stockinette. And if that isn't enough knitting, I'm sure I can find some more somewhere. If you'll be at Rhinebeck this weekend, please do say hi if you see me! Time is running out before I leave for Rhinebeck, and I'm happy to report that the projects are wrapping up just in time! I knit the last few rounds and wove in the remaining ends on Rainbow's sweater on Sunday afternoon while she worked on a project for school. She tried it on immediately, and I think you can tell that she is thrilled with how it turned out. I popped it in to soak shortly after, and it bled a lot, so I expect I'll have to give it a citric acid soak at some point (I'm really hoping it was just a case of excess dye coming out, but it's better to be safe than sorry). It's now drying, and I'll do a proper FO post once we've selected buttons and I've sewn them on. If there aren't any suitable buttons in my collection, I'll be shopping for some at Rhinebeck. The good news about this sweater is that I had plenty of yarn in the end. The pattern called for 700 yards of yarn for the largest size, and I had about 650 (though likely a bit more than that, as all three of my skeins weighed a bit more than 100 g). I did save some yardage by making the body an inch shorter than called for, but in the end I used only 580 yards. It was a real relief not to be playing yarn chicken! Another project that avoided yarn chicken is my handspun Rhinebeck socks, which ended up using a lot less yarn that I anticipated! In theory, I could have kept knitting until I ran out of yarn, but the legs of these socks were already long at 7.5 inches, so I called it quits. I used the Fish Lips Kiss Heel for these, working toe up using Judy's Magic Cast On with 20 stitches to start and increasing up to 68. There's about an inch and a half of 2x2 ribbing at the cuff, but the rest is stockinette. The eagle-eyed among you might notice that these are not actually finished quite yet, but I've only got about two more rounds to knit on the cuff of the second sock before I can bind off, so they'll be done officially by the end of the day. Because I signed up to use this skein of yarn for the Down Cellar Studio Slay the Stash event, and you really need to use all of your yarn to qualify, I'm going to use the leftovers to make a simple water bottle cozy to soak up the condensation. I tried one of my socks on the bottle the other day and it fit perfectly, so I'll just cast on 68 stitches, knit until I'm almost out of yarn, and bind off. It will feel good to get a handspun skein out of the stash! I've since gotten through the remainder of the yellow, the tan, the fuchsia, and part of the gray. I'd say I have about 10 inches of fiber left to spin, which shouldn't take too long -- maybe 20-30 minutes. So I'll be able to squeeze that last bit of spinning in this week before I leave for Rhinebeck. I may or may not get started on the third bobbin before I leave, and I'm not taking any spinning with me, so this project will be on hold for a brief time. I hope to use my long weekend away to get a ton of knitting done, and that means I'll likely be desperate to get to my wheel when I return. It's been late in coming, but I am confident in saying that fall is officially here. We woke up this morning to dark skies and rain, and tonight it's supposed to go down to into the 40s. As nice as it has been to wear skirts and sandals for a few more unexpected days, I am ready to break out the socks and sweaters. And I'm not the only one. A certain 8-year-old is very excited that her new sweater is almost done. I finished the first sleeve last night. As it took me only about three hours total of knitting time, I'm very confident that all the knitting will be done before the weekend is over. And I'll have plenty of time to block it and let it dry before I take it with me to Rhinebeck in search of buttons. I'm also feeling pretty good about finishing up what I'm now referring to as my Rhinebeck socks. I'm already nearly to the heel of the second sock. I call this one "Portrait of a Sock and a Half on a Gloomy Day"
I would've liked a new sweater for the trip, especially as it looks like temperatures will be more seasonal this year, but it's just been too busy in my life. And I'm okay with that. I have plenty of sweaters to wear (including my handspun Boxy, which has not yet had its first official wearing) and will have plenty of time to knit on the way there and back, should I wish to finally cast one on. Here's hoping that if you've been waiting for fall where you are, it arrives! Lest you think I spent the whole weekend knitting, let me tell you that I hardly sat down for most of the day on Saturday and only got about an hour and a half to knit on Saturday night. I did get a bit more time on Sunday, but not as much as I was expecting. Rainbow tried the sweater on and it hits pretty much exactly where she wanted it to, so I'm very happy. I will start on the first sleeve tonight; with any luck, the sleeves will fly off the needles. I got most of the ribbing done during lunch yesterday and did the last couple of rounds and the bind off before I had to go to a board meeting last night. In spite of my worry that I was going to be playing yarn chicken because my yardage on the skein was on the low side, I managed to knit a sock leg that's half an inch longer than my typical socks and still had yarn leftover -- and not an insignificant amount! So it looks like after I finish the second sock, I'll need to whip up something with the leftovers to qualify for the Down Cellar Studio Slay the Stash contest (I've basically got to use up nearly all of the skein for it to count). Given how quickly this first sock knit up, I'm confident that the second one will be done by the time I leave for Rhinebeck next week. So I may not have had time to knit a Rhinebeck sweater, but at least I'll have new Rhinebeck socks! It's been a very busy weekend here chez Knit/Wit (not that it isn't almost always), but I have made the time to do some spinning in addition to the knitting. I've been aided by the fact that Rainbow spent Friday evening at my parents' and got picked up by my in-laws earlier this afternoon, so I've been able to have some time to myself. Granted, a lot of that time to myself has come after running errands, doing enough loads of laundry that I've lost count, and cleaning three bathrooms, but it was enough. I managed to finish the first bobbin of singles for my combo spin earlier today. I decided to get started on the second bobbin immediately after finishing the first to keep the momentum going. Of all the colors, I'm most worried about this bright yellow causing an issue, though I'm sure it'll be toned down by the two other plies in the yarn. It is a very happy yellow, that's for sure. I'm just hoping that it plays nicely with the other colors that all seem to be in the green/blue/purple family. On the left is another dose of August's club offering, Yesterday's Love on Merino. On the right is two bundles of Eider wool in some semisolid shades. Because I have two bags of the Merino, I'm thinking I might try to spin both up identically and knit something matchy-matchy for me and Rainbow (cowls, perhaps?). I have no idea what to do with the Eider, but I'll happily let it marinate in the stash until I come up with a plan. Not much has changed in my knitting the past two days. I've continued to work on the three current WIPs, alternating between Rainbow's sweater and the shawl in the evening and working on my handspun sock during my lunchtime knitting during the day, and they've all progressed a bit past where you saw them last. I think, though, that if I want to get one of the bigger projects done, I'm going to need to put one of them down and focus on the other until it's completed. All signs point to that project being Rainbow's sweater. The pattern says to work the body until it measures 11.5 inches below the underarm; I'm currently at 4 inches. The nice thing about working with worsted weight yarn is that it does knit up pretty quickly, but I'm also alternating skeins because the yarn is hand dyed, so that means extra time spent untangling. At least the knitting itself is very straightforward and mindless, so really, if I can just focus on this one project, it shouldn't take me ages to finish. The weekend ahead looks promising for knitting time. On Saturday morning, the Mister and I are running another 5K (this one in our neighborhood, so we just have to walk up to the start line), and then all three of us are headed to get our flu shots. I expect that after that we'll all be sore and tired, so I'm planning for an afternoon of resting and knitting. Here's hoping I have more to show you next week! Do you remember me saying last week that maybe I would finish Rainbow's Hyphen by the end of September? I must've been loopy, delusional, or just plain in denial of how many days were left in the month; needless to say, I did not finish it. I didn't even get close to finishing it. I did, however, get past the split for the arms and the body, so now I am in that mindless part where I just work back and forth on the body until it's long enough. The only real thinking I have to do is counting my garter ridges on the button band to put in the buttonholes and remembering to alternate my skeins (I'm doing it on right-side rows just after the buttonhole band). I did have Rainbow try it on over the weekend and it looks like it's going to fit perfectly, with even a little bit of positive ease so it'll fit her for longer than a few months. My much more realistic goal for this sweater now is to have it done by October 28, when we have a photo shoot scheduled with a photographer friend for our holiday cards. We've done this once before, and Rainbow and I both wore sweaters that I'd made, so I guess it's become a bit of a tradition. It would be even better if I could have it done before Rhinebeck (oh yes, did I mention? Rhinebeck is a go!) so I could take it with me and buy buttons -- conveniently, there's a great button vendor in the booth right next to ours. Meanwhile, I did spend several hours over the weekend working on the minis shawl, and I've now moved onto the second pair of minis -- a beautiful autumn gold and white with gold speckles. I did play of bit of yarn chicken with the first speckled mini, but I'm happy to say that I won that round. I decided that I should be a good knitter with this project and weave in my ends as I go so I don't have them all to do at the end, so I spent some time doing just that on Sunday evening. This is going to be a big shawl, with lots of long rows, but most of it is pretty mindless, and I'm hoping I can get this done before Rhinebeck as well. There's no firm deadline for it, but I have yarn support coming my way for some new designs and I'd originally hoped to release this pattern by mid-October when I started it. Obviously ripping it out and starting over set me back some, but I'd like to get it done as soon as I can. Oh, and if those two projects weren't enough, I also cast on a new pair of socks for me in handspun. I love them already. The Night Circus by Erin Morgenstern: I remember hearing a lot of buzz about this book when it first came out a number of years ago, but I never got around to reading it. So when I saw it was available from the library (I have a lot of holds I'm waiting on, some of which are rather long), I jumped on it. I absolutely loved this book. I thought the plot was very imaginative and the writing lovely. I gave it five stars. The Woman Who Smashed Codes: A True Story of Love, Spies, and the Unlikely Heroine Who Outwitted America's Enemies by Jason Fagone: This is another much-talked-about book, and I was excited when my hold came up from the library. It didn't disappoint. It was a really fascinating look at the world of code breaking and a good portrait of an important (but largely unknown) woman who was at the center of it during the World Wars. As a result of reading this book, I'm on the lookout for others about the covert world of code breaking and counterintelligence of the time. I gave this book four stars. Still Life (Chief Inspector Armand Gamache #1) by Louise Penny: Kat has raved so much about the Inspector Gamache series that I really wanted to give one a try, so I figured it made the most sense to start at the beginning. I won't say that I didn't like this book, but I found it a bit of a struggle to read. I'm not sure if that was due to faults in the writing or by issues with formatting caused by the conversion to e-book format, but I had a few moments where I couldn't figure out who was speaking in some dialogue and spotted quite a few missing punctuation marks (principally quotation marks, which made it difficult to know if someone was speaking or not). I gave this book three stars, but I'm open to reading the next in the series to see if it's an anomaly. Talking as Fast as I Can by Lauren Graham: This was another library e-book, and it was a super quick read -- I think I read it in three or four hours total. It was light, fluffy, and entertaining, which is really what I needed last week in the wake of so much ugliness in the news last week. I gave it four stars. I'm now in the middle of Still Me by Jojo Moyes, the third in the Me Before You trilogy. I read the first two as hand-me-downs from my mother, and I didn't even realize there was a third book until I went searching for available books on the library's app. I'm enjoying it so far, and it's great to be able to read on my tablet while knitting. While I still enjoy the feel and experience of reading a hard-copy book, there is great appeal in being able to read and knit at the same time!